Fifteen years ago, Evan Marks was inspired to become a farmer and attempt to turn around the negative impact that agriculture and human living was having on the planet. From this motivation came The Ecology Center which resides in San Juan Capistrano on an acre of land that includes the historic Congdon Farmhouse erected in 1878. A non-profit, dynamic educational facility that allows people to roll up their sleeves and build a self-rejuvenating community for the environment, The Ecology Center hosts a variety of events from workshops to school programs to even the beloved Community Table dinners for both members and non-members. 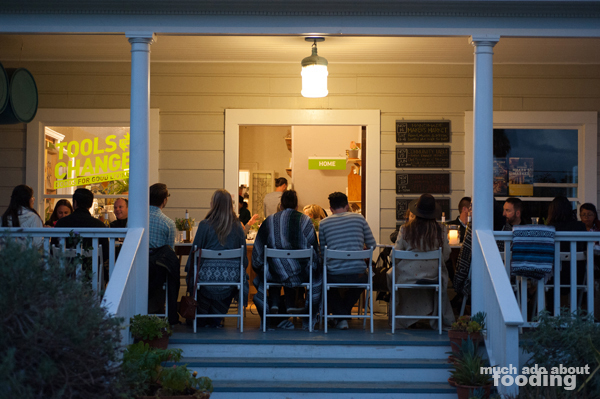 While their annual Green Feast event is well-known, the quarterly (sometimes monthly) Community Tables are more low-key but still fuel the discussion on what it means to eat consciously. 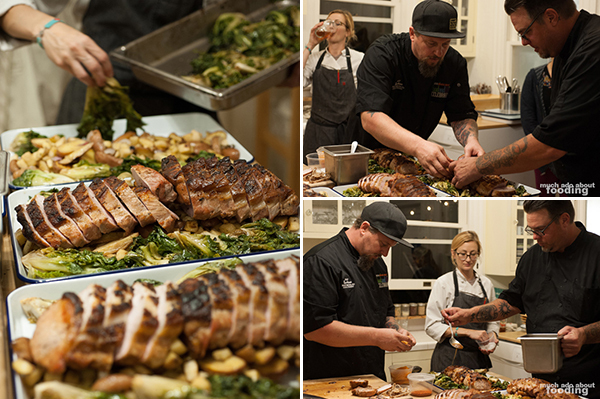 On Sunday, November 15, 2015, they hosted their last dinner for the calendar year, featuring Chef Ryan Adams of Three Seventy Common and Cook Pigs Ranch as the partnered farm source. 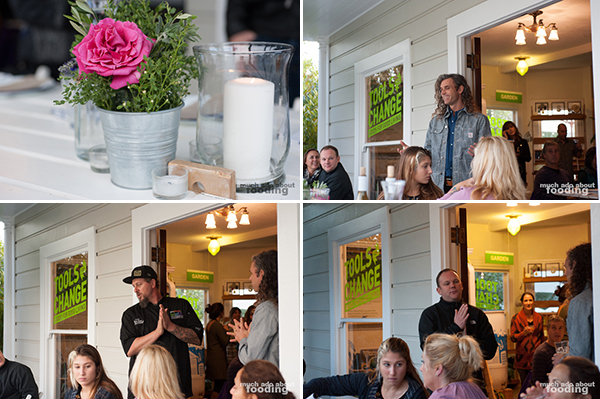 We joined others that long afternoon to indulge on the chef's creations and to learn more about how we could make each bite we take it worth it for our bodies and for our planet. "Our aim is to create a new consciousness about how food was grown, raised, and caught, and how these decisions affect the health of our communities and our environment." Before the actual dishes came out, the diners that evening partook in the free-flowing wine and beer of which the wine was donated and produced by OneHope, a label that donates a portion of their proceeds to various causes depending on the varietal purchased. The company began in 2008 in Orange County and is dedicated to giving back to the community through various ways; for example, Chardonnay gives back to breast cancer, Pinot Noir finds pets forever homes, Cabernet gives to autism efforts, Zinfandel supports troops, etc. 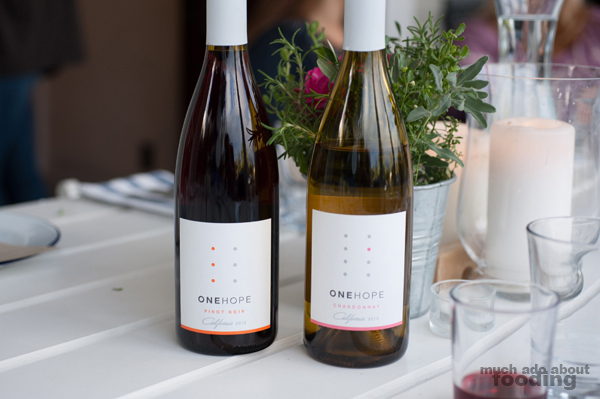 With Robert Mondavi Jr as their official winemaker, OneHope has been sure to find retail popularity, having now expanded to all 50 states.What we found interesting about the wine aside from their mission was their bottle label design; dots on the front indicate statistics for the cause the bottle supports and keeps others engaged in the story. 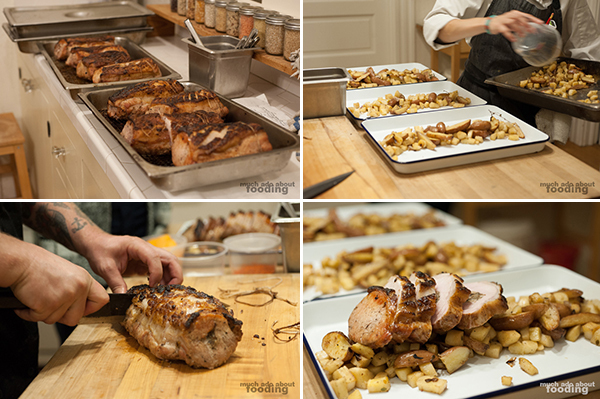 The premise of the dinner was cooking pork by using a sustainable, local ranch. The partnered farm that evening was Cook Pigs Ranch which is a family-owned operation in Julian that focuses on raising heritage pigs in a humane and sustainable way. The pigs are fed on natural, local products such as avocado, macadamia nuts, wheatgrass, walnuts, squash, mash from Julian hard cider, and apples. With that in mind, Chef Adams decided to incorporate those many ingredients into the dishes he was making or at the very least, use them for inspiration. 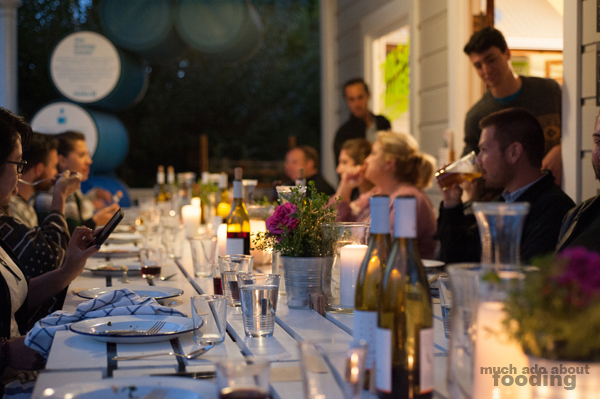 These massive courses arrived family-style, allowing for Community Table participants to engage with each other more and start conversations of what it meant to follow The Ecology Center's philosophy. 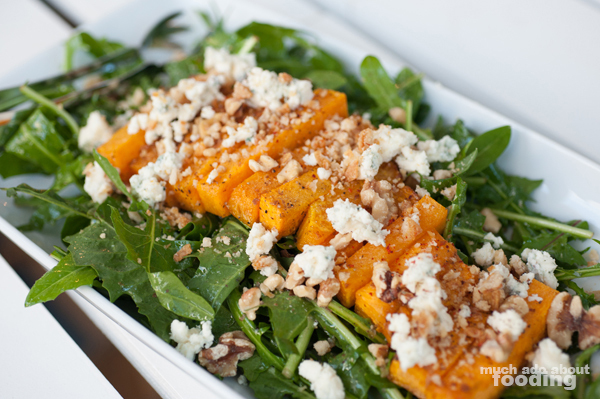 The first course was the Wood Roasted Tahitian Squash Salad (dandelion, Cook Pigs' chicharron, apple-pork vinaigrette, Blue cheese, and walnut) which was beautiful to behold. The chef pointed out that dandelion greens are often thrown away by people but are actually quite edible once combined with enough acid and salt to chase away the bitterness. Tasting how he handled the greens in this salad, we knew he spoke the truth. He also noted that the Tahitian squash came from Temecula and is also an overlooked ingredient because many people just use them as fall decorations. This was tossed with brown sugar and salt before being roasted and topped with chicharrons. To keep to his commitment to sustainable ingredients, the chef also advised us if we were to use the squash to save and dry the outer peel to keep as a firestarter; he also kept and roasted the squash seeds for the final course of the night. 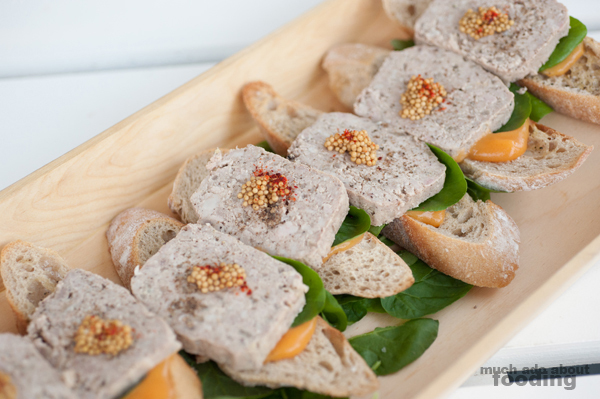 Our second course was Pine-Cured Cook Pigs' Terrine (mustard seed, persimmon, watercress, and bread from BREAD Artisan Bakery), an influence from France where terrine is typically made from leftover meat trim pieces. To make this, Chef Adams had to cook down 14 pounds of meat to form just 3 pounds' worth. Cured with white pepper and sugar, the meat had pine incorporated to it through dried pine shoots. This was topped on persimmon smear, cooked down with little vinegar and maple syrup, which added a sweet element to each bite, as well as local watercress for balance. The terrine had pickled mustard seed and a sprinkling of espelette chili powder perched atop each slice, and everything rested on slices of bread. It was excellently dense and highly flavorful. Next up was my favorite course from the dinner: Chef Adams' Cider-Braised Pork Belly (wheatgrass, Meyer lemon, and carrot). After reducing nine gallons of organic apple cider to approximately a quart of liquid, the chef drizzled the end-product over the belly and treated it all with inspiration from hay-roasting chicken. 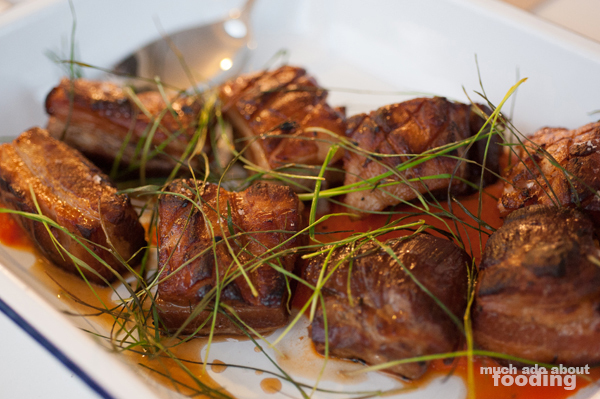 Wheatgrass made its way into the dish, thrown over the pork belly tops during roasting. There was also a puree of local carrots which included Meyer lemon juice, apple cider vinegar, maple syrup, salt, pepper, and espelette drizzled with lemon juice which proved to be a perfect palate cleanser after such rich meat. The pork belly was incredibly moist and rich, fatty and fulfilling with each bite. It had a melt-in-your-mouth quality about it that guaranteed itself as our favorite that meal. 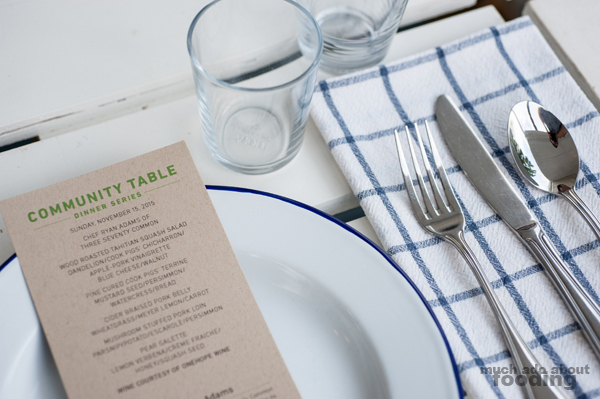 Now with these Community Table events, they serve a greater purpose than being excellent, conversation-starting meals. The Ecology Center announced that they were putting together a cookbook based on people gathering to learn what seasonal food looks like and what positive solutions could be. 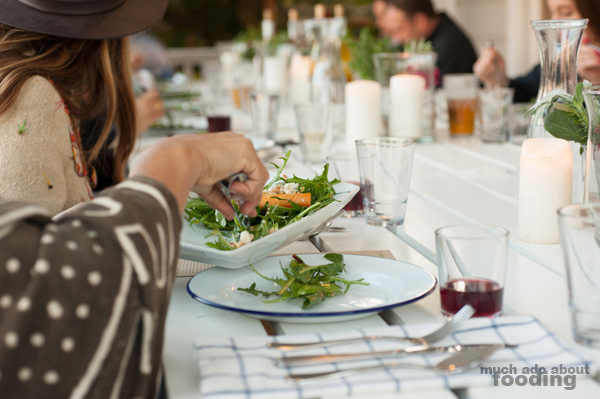 The book will document every dinner every month and eventually culminate to the interactions at Green Feast. The target date for release is September 2016 so make sure to mark it on your calendars! Members will receive a discount code for pre-order sales. Each chapter will be a different chef with a different sourcing partner following the theme of sustainable food systems. The sustainable message shared at this Community Table? Ensure you are eating meats that have been properly and humanely raised! Our next course was an impressively massive Mushroom-Stuffed Pork Loin (parsnip, potato, escarole, persimmon, and oyster mushrooms) which came atop many vegetables. 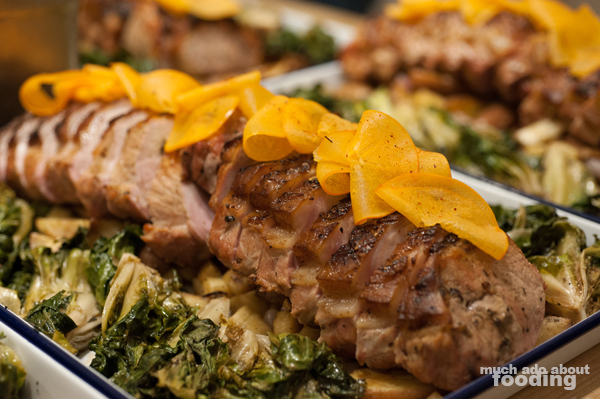 The pork loin was brined before being pulled out; stuffed with a hard saute of local oyster mushrooms; roasted over wood; laid atop local fingerling potatoes, parsnips, and escarole; presented with thinly sliced persimmons on top; and glazed all over with the apple reduction. This all came together to make an incredibly moist and hefty hunk of pork which we indulged much in. The escarole was also done very well given its simple combination of salt, pepper, olive oil, and lemon. To end that night seemed a tragedy but once the servings of Pear Galette (lemon verbena, creme fraiche, honey, and Tahitian squash seed) circulated, everyone knew it was time for dessert. The freeform tart was made with a little sugar, a touch of butter, lemon zest, lemon verbena, creme fraiche with lemon verbena in it, charred honey, roasted seeds from the Tahitian squash with sugar, and delicate violets from outside. 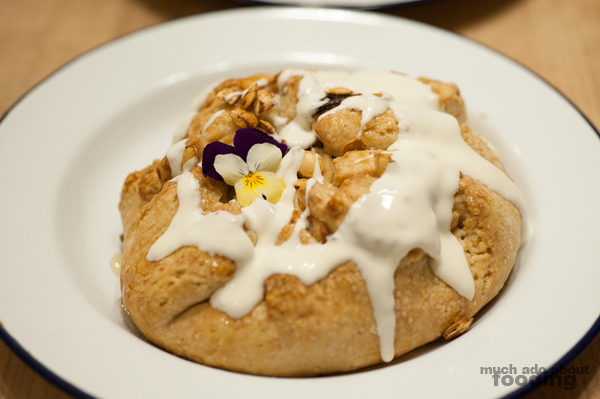 The pastry portion was undeniably satisfying and even with all of those other ingredients, the galette balanced well. 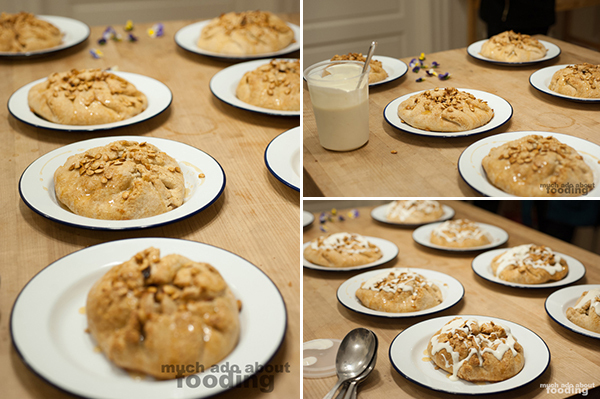 It had just the right amount of sweetness and featured interesting textures such as the crunch from roasted seeds and the gooey, stickiness of the honey. I could have that galette every day! Focus on urban farming so there will be several purveyors and solutions to address farming in tight urban spaces whether through community gardens or aquaponics. To learn more, visit The Ecology Center's website and calendar of events.